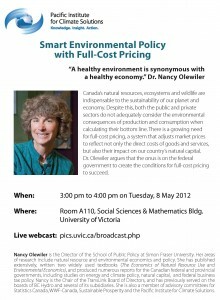 The Pacific Institute for Climate Solutions presents “Smart Environmental Policy with Full-Cost Pricing” by ACT board member, SFU economist and professor of public policy, Dr. Nancy Olewiler. Canada’s natural resources, ecosystems and wildlife are indispensable to the sustainability of our planet and economy. Despite this, both the public and private sectors do not adequately consider the environmental consequences of production and consumption when calculating their bottom line. There is a growing need for full-cost pricing, a system that adjusts market prices to reflect not only the direct costs of goods and services, but also their impact on our country’s natural capital. Dr. Olewiler argues that the onus is on the federal government to create the conditions for full-cost pricing to succeed.